Kevin Starr, the former California state librarian and historian (right), with former Gov. 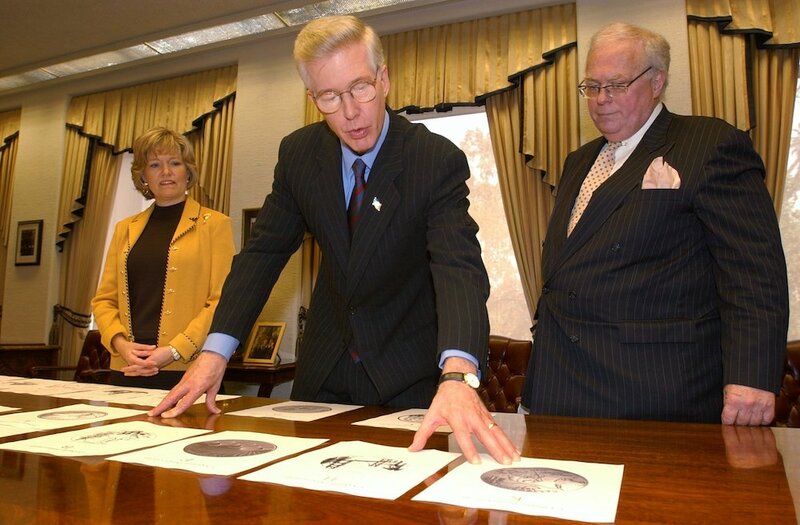 Gray Davis and first lady Sharon Davis, inspecting some of the finalists for the design of California’s commemorative quarter, March 11, 2003, at the Capitol in Sacramento. Photo by Steve Yeater/Associated Press. Kevin Starr is widely regarded as California’s pre-eminent historian—a prolific author and public intellectual for nearly 50 years—and his death earlier this year generated much writing about his life and scholarship. But one episode in his life was not widely known or much remembered: his race for San Francisco Supervisor in 1984. I was a volunteer in that campaign, and got to see firsthand how the campaign, and its aftermath, would influence Starr’s career—and by extension Californians’ understanding of themselves. Starr came to the 1984 race with a decade-long involvement in city government and journalism. He was born in San Francisco and spent part of his early life in a Catholic orphanage in Ukiah, after his parents divorced and his mother had a nervous breakdown. He served in the U.S. Army after graduating from the University of San Francisco in 1962, and then received a doctorate in American literature from Harvard in 1969. He became an aide to San Francisco Mayor Joseph Alioto in 1973, and over the next 10 years his career advanced rapidly, first as the appointed city librarian, and later as a popular columnist with the San Francisco Examiner, and university faculty member. The initial volume of his now famous multi-volume history of California, Americans and the California Dream, 1850-1915, was published in 1973, followed by his only novel, Land’s End, in 1979. The official campaign kickoff was held at the Gift Center Pavilion at 8th and Brannan streets on March 15, 1984 before an overflow crowd of more than 250 people paying $150 per ticket. Starr followed this up with an immersion into the retail politics of the city, enthusiastically passing out leaflets on street corners and at Muni bus stops, attending the nightly bingo games, and appearing at neighborhood “meet and greets” hosted in the homes of supporters. Readers of the Jewish Bulletin were greeted by an ad at the Passover holiday, “Passover Greetings from Kevin Starr,” in which Kevin was identified as an “Honorary member of Congregation Magain David Sephardim,” a synagogue in the Richmond district. But as the campaign progressed into the summer, it became clear the city was becoming a different place from the familiar one that Starr grew up in, and even from the San Francisco to which he had returned from academia in 1973. Identity politics had long been part of the civic culture of San Francisco, as it was in other major cities. But by 1984, identity politics had come to assume a central role. Throughout his campaign, Starr was both mystified and angered by what he considered to be a pandering attempt to divide the city by race, gender, or economic status. … He saw San Francisco through the lens of a “civic culture,” by which race, gender, and economic status were secondary to San Francisco as a greater entity. More than 20 different Democratic clubs that were largely based on ethnicity, gender and sexual orientation had come into existence. There were good reasons for this. The city’s gay and lesbian community had been shut out of most elected and appointed offices for years (Harvey Milk, the first openly gay elected official had only been elected in 1978). The first Asian American Supervisor, Gordon Lau, had won office only in 1977. In this new political universe, Starr had no natural politically active base. Only the Wallenberg Jewish Democratic Club, among the major clubs, endorsed his candidacy. The power of identity politics was just one piece of a shifting political culture with which Starr had to contend. Despite the city’s influential bohemia, local politics previously had been rooted in a middle class, centrist orientation. The emerging political culture in 1984 was one increasingly unmoored from the middle class or taxpayers or private businesses. No one embraced this new culture more cleverly than a young assemblyman, Art Agnos. With his eyes on higher office, Agnos went around the city denouncing amorphous “downtown interests,” or “the wealthy,” and promising new government programs and spending for each group. Throughout his campaign, Starr was both mystified and angered by what he considered to be a pandering attempt to divide the city by race, gender, or economic status. When the various Democratic clubs sent out questionnaires asking for support for their advocacy or projects, campaign volunteers would urge Starr to play ball. But Starr always refused to tell these groups what they wanted to hear. He saw San Francisco through the lens of a “civic culture” by which race, gender, and economic status were secondary to San Francisco as a greater entity. In the fall, after the Democratic Club endorsement season, Starr’s campaign seemed to regain its balance due to two dynamics: endorsements from the city’s two largest newspapers, and an active street presence from volunteers who had come to the campaign since Starr announced. On election day, Starr and his advisors thought he had a good chance to finish in the top six; six of the 11 Supervisor seats were up for election in 1984. But it was not to be. By the time most of the votes were counted the following morning, Starr had finished in seventh place, just out of the running. He would receive more than 90,000 votes, but fell well behind the sixth-place finisher, Carole Ruth Silver who had more than 125,000 votes. Starr did not immediately withdraw from local politics and government. In 1989 he became active in a campaign to oppose a new city-funded ballpark, being pushed by Agnos, who in 1987 was elected mayor. Starr believed that city funds should not be used for sports facilities, and authored a pamphlet arguing that such funds could be put to better uses. On November 6, 1989, the day before the election (which saw the ballpark proposal defeated), Agnos and his campaign operatives struck back. The San Francisco Chronicle carried a front-page story in which Starr was accused of taking funds from a Sacramento developer for the pamphlet, without proper disclosure. The District Attorney became involved. The grand jury found no basis for indictment. But the incident ended Starr’s local political participation. It also launched Starr into a different career, no longer tied to San Francisco. In 1989, he became Professor of Urban and Regional Planning at the University of Southern California (USC). He and his wife Sheila kept their apartment in San Francisco, but increasingly spent time in Los Angeles, and later in Sacramento, when Starr was appointed California State Librarian in 1994. Starr served as State Librarian through 2004. For a decade in this position he traveled throughout the state lecturing and holding town meetings at public libraries. He would go to small branch libraries in Shasta, Merced, Oceanside, and Glendale. At each he would greet patrons, extol the role of the public library in a democracy, and urge local investment and support for library upkeep and development. He found a political role—in meeting Californians, inspiring them, achieving important library improvement projects—initially denied him in San Francisco. In the end, he accomplished far more in this role than if he had been elected Supervisor in 1984. Michael Bernick is a former Director of BART, and also a former Director of the California Employment Development Department. Since 2004 he has been an attorney with Sedgwick LLP and Milken Institute Fellow. The California State Library has a collection of his papers and writings relating to transit, employment and anti-poverty programs in California.